Join Perkiomen Tours as we travel to Hampton, NJ for lunch and the "Barefoot in the Park" show at Hunterdon Hills Playhouse. 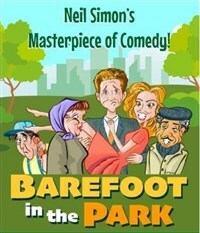 "Barefoot in the Park" ran on Broadway for five years, and was a winner of the Tony Award! Here is your chance to see this rib-tickling comedy at the nearby Hunterdon Hills Playhouse in Hampton, NJ. This hilarious romantic comedy will focus on a pair of newlyweds as they begin married life in a tiny, 5th-floor walkup apartment in a Manhattan brownstone. Lunch and Show "Barefoot in the Park"
"Barefoot in the Park" will show the silly squabbles of a young married couple, Corie and Paul, and will make the obstacles they must face together absolutely hillarious! Corie sees their tiny new apartment as cozy and romantic while Paul only sees five flights of stairs, a gaping hole in the skylight, and heat that doesn't work. Add oddball neighbor: Victor Velasco, and Corie's well-meaning mother into the mix, and it's a recipe for non-marital bliss!